Nephrologist - a specialist who deals with diagnosis, treatment and prevention of various renal pathologies, conducts rehabilitation activities after surgery. • Treatment of hypertension associated with diseases of the urinary system. The objectives of Nephrology are first of all identifying the causes and establish the factors that lead to the kidney disease. To solve this problem, nephrology engaged in a thorough examination of all pathological processes that overwhelm the organism during the development of kidney disease, the development of a criteria diagnostic, which are necessary for a correct diagnosis. any other diseases, and kidney damage during the systemic diseases such as lupus, vasculitis and other. In nephrology, there such concept as a silent phase of the disease. This disease occurs in humans, without showing to any painful sensations. For several decades a person can just feel the fatigue, drowsiness, loss of appetite and weight, mild discomfort in the stomach, insomnia, migraine. And only when there is a clear reduction in the functional activity of the genitourinary systems of the organism and swelling of tissues, then we can talk about the manifestations of the disease in the kidneys. The clinical situation in Nephrology is a fundamental factor in the diagnosis of diseases. Since all kidney disease are quite diverse among themselves, the clinical picture everyone has their own. Swelling of the kidneys - is manifested outwardly swelling (face, eyelids). After some time, appears swelling of extremities, back and stomach. Change the color of the skin. The skin of the patient becomes pale in inflammatory processes. The sharp increase in blood pressure, weakness and dizziness. Explicit and visible changes in an amount and composition of urine. When Urolithiasis in patients appear sharp, sharp, stabbing pains in the lumbar region. Pyelonephritis manifests itself very concretely - the patient feels a nagging, dull pain in the lumbar region, chills, fever and frequent urge to urinate. Laboratory: urinalysis and urinary sediment, complete blood count, blood chemistry with a thorough study of urea, potassium, creatinine, chloride, protein, sodium and albumin. Instrumental: renal ultrasound, x-ray of the kidneys, computed tomography, magnetic resonance imaging, bladder catheterization, renal biopsy, radioisotope renography, excretory urography, selective arteriography of kidney, scintigraphy. In order to establish an accurate diagnosis and effective treatment of kidney disease always requires the use of a comprehensive methods of examination. Prophylactic methods of renal disease is aimed at reducing in the human body uric acid, its dissolving and excretion. Proper nutrition: exclusion from a ration all smoked products and fried foods, salted fish, any sweets, meat and bone soups. The diet should be maximally is filled with fresh fruit and vegetables, juices, sprouted wheat grains. Reception of melt water with a few drops of lemon juice (order to dissolve kidney stones). To drink purified water, cook the food on thawed water, eat mild food, drink herbal teas. Spend more time outdoors, engaging in physical exercise, be in calmness and equilibrium. In summer excellent preventive method of kidney disease is the use of water-melons, and in winter - the reception of broth hips. Thus there is a complete cleansing of the kidneys from sand and stones formations, stops inflammation. All these methods of prevention help prevent of inflammation and the accumulation of sand and stones in the kidneys and, consequently, acute renal diseases and their development in the chronic form. Since a large part of all kidney diseases are caused chronic disease of organism, such as diabetes and high blood pressure, and therefore the treatment first of all directed to maintaining a certain level of sugar in the blood and normal pressure. Such an approach to treatment can slow or suspend the process of development kidney disease. Technique of treatment of kidney disease also includes a technique of reducing the Overweight, moderate employment by physical culture and timely reception of medical products. 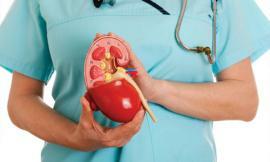 Renal failure is treated by two methods: dialysis and kidney transplantation.